Sutorbilt 3MP Blower Equivalent to a Roots 33 Delivers 273 CFM @ 15 HG (max) Vacuum lift. 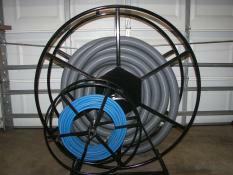 Can use up to 300 Ft. of hose. Automatic Sensored Temperature & Hi -Limit Regulation will give you the Security of Constant Heat without the worry of overheating even while the machine is running and no carpet cleaning is being performed (or while talking to your Customer, Pre-Spraying, moving furniture, Etc. Optional Upgrade 75 & 100 Gallon Aluminum Tanks with all the features mentioned above. will give you the Security of Constant Heat without the worry of overheating even while the machine is running and no carpet cleaning is being performed (Time talking to your Customers, Pre-Spraying, moving furniture Etc. Optional 75 or 100 Gallon Heavey Gauge Marine Alluminum Waste Tank with all the features listed above.